In case you were not aware Mora are releasing a new outdoor Bushcraft knife in April this year. 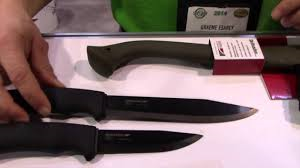 Its the big brother to the Mora Black and it's tentatively been called the Pathfinder, almost identical to the Bushcraft Black but with a larger 6 inch blade. This is one knife I'm looking forward to getting. Here it is , the top one in the pic, however if the rumours are true the price will shock you as there's talk of it being around £65 !!!!! I see Cody has been fired from Dual survival, well brother all I can say is what goes around comes around. We will still continue to support Dave Canterbury. I've been looking for these for years and only ever found them once, but while taking the dog for a walk only about 50 yards from the house..look what I came across!!! find some willow or hazel poles long enough to make your shelter , usually about 7 or 8 feet will do depending on the size of shelter you have in mind. start fixing the other poles to the main frame, to make it quickly and use 21st century items we used cable ties and duck tape, but it's up to you how primitive you want to make these. it's an incredibly easy and fast shelter to build and that's exactly what a survival shelter should be! if you have to spend 6 hours building a stacked debris hut you're definitely doing something wrong and in a true survival situation you could be risking your life! build your fire in front, the heat radiates all around the inside of the shelter making it incredibly warm! When it comes to shelters we use the 3 W's .. each shelter must be , Windproof, Waterproof and Warm, and this little outfit, that took only 30 mins to build, does each of these perfectly! and of course I did just such a thing in the woods the other day, and to make matters worse I'd forgotten my First aid kit!! Luckily Davy had his. The wound was deep and I saw the tendons in my finger though luckily I didn't cut them or Id have needed surgery..A quick response with the FAK enabled a clean and quick healing cut.. But I should have taken my own advice... never wrap your hand around the sheath when drawing your knife, always pinch it, away from the welt and draw slowly! !